Mary was not the only one visited by angels in advance of Jesus’ birth. In this story, God sends an angel to prepare Joseph for his very special role in the Christmas story. Ultimately, Joseph accepts Jesus as his son. This lesson was first used in a broadly graded children’s church program. It could easily be adapted as a Christmas Sunday School lesson or used in other ministry contexts. The emphasis on this lesson is the amazing facts about Jesus that Joseph learns from the angel. There is also some advanced teaching on the two natures of Christ – fully God and fully man. Learning Objectives: After this lesson . . .
Children will demonstrate a basic understanding of the two natures of Christ … by explaining in their own words how Jesus is both 100% God and 100% Human. Marked Bible: Read Matthew 1:18-25. Prepare the copy in advance by highlighting the significant points to emphasize and underlining items that will need additional explanation. Word Clues: Write the following statements on separate pieces of paper. Use different colors if available. Show the children the three word clues. Display them on the wall. 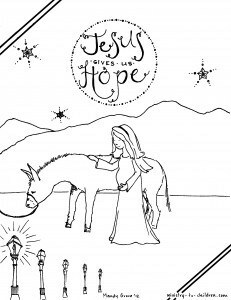 Each word clue will help them discover something amazing about Jesus from the story. Ask the children to listen carefully for these word clues in the story. Read (and summarize) Matthew 1:18-25. (Read with emotion and pause often to engage the children with the reading.) Make special note that Jesus was born of the Holy Spirit and of Mary – so he is both really God and really human. During the telling of the story reinforce the three amazing discoveries about Jesus. Holy Spirit – Jesus was born of the Holy Spirit. Immanuel – Jesus will be called Immanuel, which means God with us. Save – Jesus will save his people from their sin. After the story, use the word clues and ask for volunteers to share their amazing discovers about Jesus. 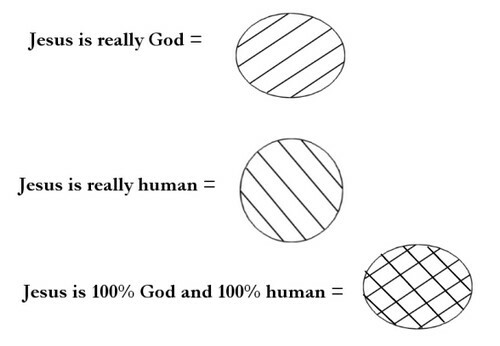 Draw the picture on the marker board that explain that Jesus is both 100% God and 100% Human. Invite one student to come forward and draw the same picture and repeat your explanation. 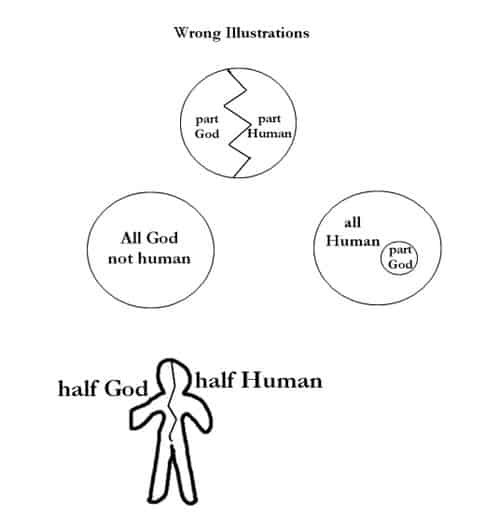 Then draw several wrong pictures and explain why they do not show how Jesus is both 100% God and 100% Human. Write on a marker board (or say) the three amazing facts statements but leaving out the “word clues.” Have the children guess the word you left out. Leave out the underlined words. Jesus was born of the Holy Spirit. Jesus will be called Immanuel, which means God with us. Jesus will save his people from their sin. Read the following statements. Ask the children to stand up to answer YES. Could Jesus be really human if he did not have any human parents? NO. Could Jesus be really God if he had both a human mother and father? NO. Could Jesus be really God if he was born of the Holy Spirit? YES. Test: Use the three “word clues” to prompt volunteers to state the 3 amazing facts they learned about Jesus from this story. Ask for volunteers explain in their own words how Jesus is both 100% God and 100% Human.